In the world of luxury travel, few providers hold a candle to Abercrombie & Kent. A&K travel conjures up images of elegant, five-star accommodations, customized itineraries with expert guides, the finest of Michelin-rated dining, and cushy modes of transportation. And, of course, the hefty price tag that comes with all of those extravagances. Looking for all that glitz on a budget? Consider A&K Connections, a new line of luxurious journeys for small groups of 24-28 guests that offers 17 itineraries from six continents. Some of the available destinations include Australia, France, India, Morocco, and Peru. I recently joined A&K on a preview of their "Spain: Seven Cities tour" to see firsthand what Connections is all about. The cities that make up the title include Barcelona, Granada, Marbella, Gibraltar, Seville, Cordoba, and Madrid. 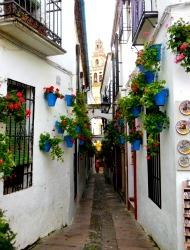 Tally up the day-trips to Malaga, Ronda, and Jerez, however, and you’re looking at a whopping ten cities packed into a ten-day tour. The preview trip was condensed into seven-days. Needless to say, at times, this felt like a break-neck pace, even with Gibraltar sliced off the itinerary. I’d imagine the ten-day version to be just slightly less speedy. Despite the pace, it’s hard to say which part of the trip I would eliminate to slow things down. In retrospect, it’s easy to see why Simon Butler-Madden, an A&K vet who built many of the Connections itineraries, included all the sights we saw; the trip provides a cohesive overview of Spain’s diverse history, and how that history affected all aspects of modern Spanish and Catalonian culture. Getting around from city-to-city was done in true A&K style. A shiny, black Mercedes Benz minibus with a spacious leather interior awaited our group in both Barcelona and Madrid, and was the vehicle of choice during our daytime tours and excursions. A similar minibus whisked us through Granada, Seville, and the many other cities seen in Andalusia, Spain’s second largest autonomous region. A comfortable, high-speed train glided us from Cordoba to Madrid. The one and only transportation pitfall was the Vueling flight we took from Barcelona to Granada. There was so little leg room that a paperback book could barely squeeze in between my knees and the seatback ahead of me. Such is the pleasure of modern (regional) air travel. Upon arrival in each new city, we were greeted by A&K’s lovely local guides, each equipped with a wealth of knowledge on their given locales. From pointing out unexpected details of the Goya collection at the Prado Museum, to leading us through the charming, winding streets of Cordoba, to explaining the complex fermentation process of Sherry making at a bodega in Jerez, every guide held our interest with their expertise and passion for their local histories. Just one minor gripe: some flexibility as to which sights you’d like to be guided through would have been nice. We saw every city’s landmark Gothic cathedral, and frankly, they all start to blend together. As our guides led us to some of Spain’s most popular attractions, such as Barcelona’s famed Sagrada Familia (a cathedral absolutely worth seeing), and Granada’s Alhambra, I quickly realized one of the best perks of booking a tour with A&K: skipping any and all lines. Even in the chill of December, the line to enter Sagrada Familia easily wrapped around the block, and then some. Average tourist wait time: one to two hours. A&K wait time: 30 seconds. While there were no lines to be seen at Alhambra in December, our guides stressed that in peak season it’s difficult to even get in due to crowd limitations. A&K guests receive guaranteed admission, and get to skip those lines. All that sightseeing surely builds up your appetite and A&K ensures you’re well fed. The price of this particular Connections tour includes 17 meals – continental breakfast at every hotel, and either lunch or dinner most days. This is one way in which Connections differs from A&K’s private and small-group journeys, which build in each and every meal throughout your trip, often at top-Michelan-rated restaurants. I much prefer the Connections approach to dining. The restaurants selected for our included meals may not be considered the best-of-the-best by the world’s culinary elite, but the food was fresh and delicious (tapas galore), the wine and beer tasty and plentiful, and the atmosphere warm and relaxing. One dinner in Seville even came with a traditional Flamenco performance. The meals I was responsible for provided welcome chunks of free time, allowing me to do some exploring at my own pace. After days and nights full of plentiful activities, the plush hotel rooms eventually called my name. Three of the four hotels earned five-stars. The unanimous favorite among our group was the Moorish-inspired Alfonso XIII Hotel, which recently joined the Starwood family. Colorful tile mosaics covered the walls, a grand staircase wound its way up the main lobby, a generous continental buffet breakfast was available each morning, and my spacious room offered a modern yet timeless respite with unimaginably comfortable beds. 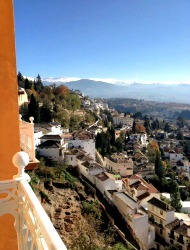 The non-five star hotel was the four-star Alhambra Palace in Granada. While this stay undoubtedly featured the most stunning views – the hotel overlooked the entire city with the sweeping Sierra Nevada Mountains as a backdrop – the rooms were mediocre at best. The full Connections itinerary includes a second four-star stay in Marbella. I’m the type of traveler who would rarely consider a group tour for my getaways – I often associate such vacations with large numbers of unadventurous tourists spilling out of charter buses , clogging the street. Not with A&K Connections. The groups are kept at manageable numbers, and I could not fathom beginning to put together such a journey myself. It would easily take months of planning. I left Spain feeling truly enriched and satisfied, inspired to return to explore my favorite cities from the trip in more depth. For luxury travelers on a budget who have always sought after the A&K experience, Connections is the ideal fit. Abercrombie & Kent Connections group journeys start at $3,395 per person, without air. The Spain: Seven Cities package starts at $5,495. Travel on select dates April through October. For more information visit www.abercrombiekent.com/connections.